Zombies again, they are more common nowadays in death metal than in Italian films in the early eighties. The basics are as described by the record companies, Stockholm sounds are interspersed with grinding drums and Americana of the deadliest kind. The zombie hordes run amok to the intro tones of massacres and lunches, or simply by the massacre of the drum sticks. Drummer Tomasz has certainly earned his share of the eventual profits in sweat! They have a penchant for light but noticeable experiments; the riff of “We Must Eat!” sounds like a bass line, the overall sound experiment in “Deadtribe Sinister” sounds like a concert in a venue with an uneven roof that distorts the sound waves, and “Planet Zombie” has epic parts, a feature that puts a Finnish like touch to the music at times. But the common denominator is death as it used to be. 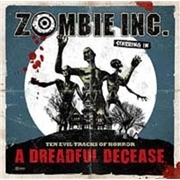 ZOMBIE INC. does their best but the variation might even be a curse as they might scare off the death fundamentalists. Those into more experimental death might well be thrilled, since this is not carbon paper 90´s death. The experimental parts are not entirely wasted, but see hushed down? They don´t foul up in any aspect, it´s just that there are so many zombies around… Some get chopped by the outboard motor, some survive, you judge.